It’s shortly after dawn. Today was the first day that the wind has settled down enough for the Exuma Park Warden patrol to set out looking for poachers. (Poachers are people who hunt or fish illegally.) I was lucky enough to ride along on the park’s fast ski boat. I was riding along with three others. 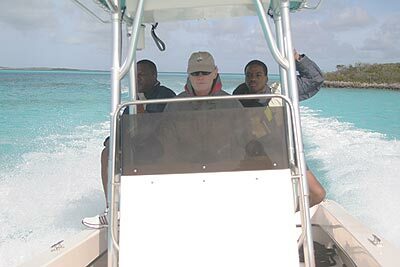 Larry, a three year volunteer at the Exuma Park and two Bahamian Navy personel, Eddie Rolle and Dee Stevens. Exuma Cays Land and Sea Park is a NO take zone and that means absolutely no fishing of any kind can take place within its boundaries. Unfortunately some people do not abide by this law. So Park officials together with the Bahamian Navy, patrol the Park to enforce the law. Our first decision as we leave the Park headquarters, which is situated in the middle of the 30 mile park, is which way to head – north or south. Today we headed north first. The wind is still blowing about 18 knots so the waves are pretty big. It’s a rough and bouncy ride as we zig zag at high speed between the small rocky islands or cays. We zoom in and out of all the little coves checking any “private” places where people and a boat may hide. After reaching the northern boundary, we head all the way to the southern boundary. By now, the tidal currents have begun to die down but we we now going against the wind so it’s a wet and bouncy ride. About 45 minutes later we reached the southern boundary finding no poachers today. The greatest challenge of catching poachers is that you must catch them “in the act” of poaching. This evidence is what you can then use in a Court of Law to prosecute them. As with many offences, the price is very high if caught poaching – your boat, vehicle and all gear are confiscated and never returned. That can be very costly, if the boat you use to poach is an expensive one. So, as you can imagine, poachers are very fast and sneaky. We moved onto one of the other official jobs of patrolling – boarding and checking the papers of boats traveling through the Bahamian waters. Today ,we boarded a cruiser like us. After we had pulled up behind the cruiser, Able-seaman Eddie Rolle boarded the vessel to check the cruiser’s cruising permit. All papers were in good order, so, we bid the visitors fair winds and continued on patrol. We carried on, passing by visitors who were snorkeling in the caves and checking out the wonders of the Land and Sea Park. The winds settled down a little more for a dry motor back to Park Headquarters. Another good day of patrolling.